Late in the game, the Obama administration decided to reclaim the derisive label “Obamacare”. After all, says President Obama, “It’s true. I do care.” Sound tactical decision, acknowledgement of messaging failure, or Hail Mary? In USA Today, uses of the term “Obamacare” have far outstripped the term “Affordable Care Act,” the title which Democrats have generally favored for the law. 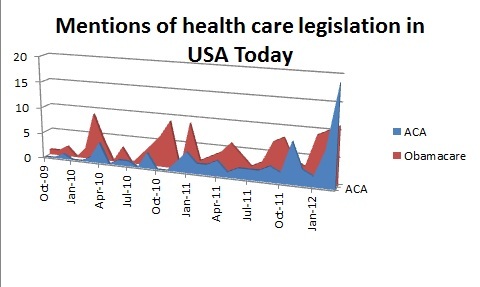 The final spike in use of the term “Affordable Care Act” shows stories reporting on the Supreme Court case, which against all odds seems to have actually retained the law’s original name in its title. Like “Reaganomics” and “the Bush tax cuts” (and “Mr. Madison’s War,” for that matter), the “Obamacare” label is an effort to link personal evaluations of the president to a particular policy. Depending on the direction of those evaluations, this is intended to lead a group of people to understand that they don’t need to know anything substantive about that policy at all – through the strength of heuristic cues, they already know they hate it. This group of people will never find it sweet that Obama says he cares. They probably just find it creepy. On the other hand, the “Affordable Care Act” has the seeds of a very appealing bipartisan message: government regulation of health insurance will make it affordable. Sadly, that was the public messaging campaign that never was.